Hillary Clinton’s plan to establish a no-fly zone over Syria would “be a disaster” that could lead to a military confrontation with Russia, retired U.S. military pilots said. “If she is not politically posturing, it’s going to be a disaster,” John Keuhn, a retired navy officer who flew no-fly zone missions over Bosnia and Iraq, told The Guardian. “I see almost nothing positive that can come from implementing [a no-fly zone] at the current time over Syria. Conversely, the potential to make a bad situation worse is very, very high,” said Keuhn, now a professor of military history at the U.S. Army Command and General Staff College. 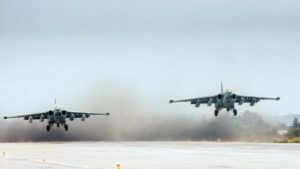 David Deptula, a retired air force lieutenant general who commanded no-fly zone operations over northern Iraq in 1998 and 1999, said the Russians were a “complicating factor” to a fundamental problem with a no-fly zone in Syria. “Until a strategy that defines the desired end-state is clearly laid out in a comprehensive way, it’s difficult to advocate for a no-fly zone,” said Deptula. Military analyst Joshua Rovner of Southern Methodist University said he has a hard time understanding how a no-fly zone provides the U.S. leverage over Syrian President Bashar Assad or Russian President Vladimir Putin. Critics of the Clinton’s plan also say establishing a no-fly zone over Syria would be much more difficult than previous challenges the U.S. faced over Libya, Bosnia and Iraq. Assad’s surface-to-air missiles protect the Mediterranean coast and southern regions while Russia has deployed advanced S-300 and S-400 systems that can blanket the majority of Syrian airspace with missiles. Staging a no-fly zone over Syria would also require an expensive deployment of U.S. aircraft carrier groups and the cooperation of regional allies, Turkey primary among them. But, Turkey in recent months has been focused on improving ties with Moscow after relations with the U.S. took a turn for the worse after Ankara accused Washington of having a role in a failed coup attempt earlier this year. Russia and the U.S. currently share the skies above Syria and maintain a military-to-military communication channel to avoid confrontation.